The palliative and end-of-life care movement worldwide has been a success story in many respects. Palliative care services exist in many countries throughout the world and are increasingly integrated into mainstream health services. Despite these achievements, the movement continues to face challenges from demographic trends, changing patterns of illness, and social contexts of care, which suggest an increasing need for services. Questions have been raised regarding the appropriateness of building further services, as compared with new perspectives on care, which see communities and professionals working in partnership. These perspectives are collectively known as the new public health perspective and this chapter details the emergence of new public health perspectives in end-of-life care. Lalonde, M.. A new perspective on the health of Canadians. Ottawa, ON: Minister of Supply and Services Canada. Retrieved from Public Health Agency of Canada website. 1974. http://www.phac-aspc.gc.ca/ph-sp/pdf/perspect-eng.pdf. Paul S, Cree V, Murray SA. 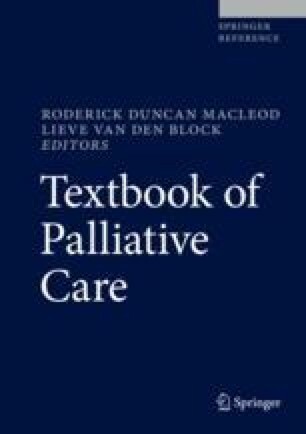 Integrating palliative care into the community: the role of hospices and schools. BMJ Support Palliat Care. 2016; https://doi.org/10.1136/bmjspcare-2015-001092.